My recent electoral trip to Hyderabad was to gauge the mood of the Telangana people regarding the elections to the Legislative Assembly. Various exit polls show that TRS is coming back in the state. The festival of democracy is marred by nastiness with the entry of Uttar Pradesh Chief Minister Yogi Adityanath for poll campaign. He said, Asaduddin Owaisi will run away if the Bharatiya Janata Party (BJP) comes to power after polls. Owaisi retorted to Yogi and asked him to care more about the children dying in UP’s hospitals. Yogi’s assertion to rename Hyderabad as Bhagyanagar in the future elicited a direct response from the Telangana caretaker Chief Minister and President of Telangana Rashtra Samithi (TRS), K. Chandrasekhar Rao. Rao questioned the logic of renaming and asked if Yogi will ‘get a kilo of gold’ from every household if Hyderabad is renamed. The Mahakutumi –an alliance comprising the Congress, Telugu Desam, Telangana Jana Samithi and the Communist Party of India (CPI) is largely seen as an opportunistic alliance. Congress President Rahul Gandhi and Telugu Desam President and Andhra Pradesh Chief Minister N. Chandrababu Naidu have been making joint appearances at meetings and rallies. The question that is being asked is whether the cadres will work to transfer votes to their alliance candidates. Any future alliance for Lok Sabha to continue will depend on the outcome of the Telangana polls. K. Chandrasekhar Rao is going hammer and tongs at the Congress, Telugu Desam and the BJP. The welfare schemes that his government initiated like the Rythu Bandhu – Rs. 4,000 per acre compensation for crop, pensions to senior citizens, distribution of 20 sheep and a ram to shepherd families, the marriage schemes – Laxmi and Shadi Mubarak, overseas scholarships to students including minorities have endeared him to the masses. The curfew-free Hyderabad and Telangana have given a boost to TRS and the MIM. The masses are appreciating that there have been no riots and curfew during the tenure of KCR government. KCR’s son K. T Rama Rao has been making a successful connect with the urban masses and taken up campaign in a confident way. 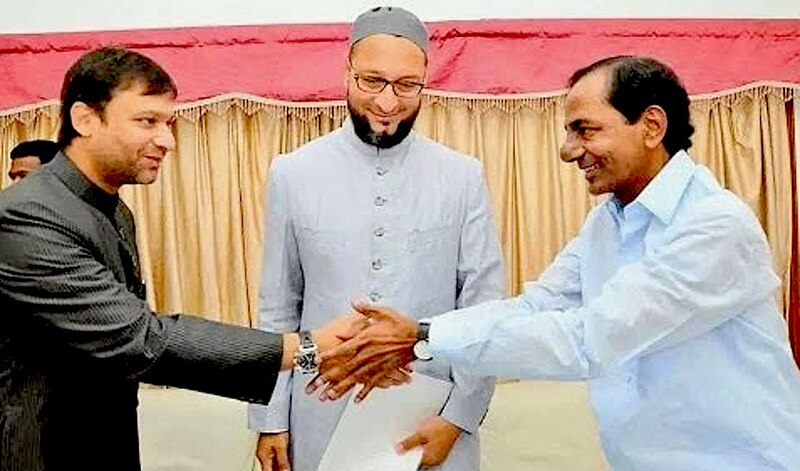 The TRS – MIM alliance looks formidable and a firm favourite. Politics is a game of possibilities. The main focus of Asaduddin Owaisi is only on the 8 seats in Hyderabad. And he wants to intact minority votes in his favour. If the results are otherwise, it could be due to anti-incumbency of the local TRS legislators. It is significant to note that all the sitting legislators of TRS have been renominated to fight the polls. MIM has repeated their legislators too. The results will have a bearing on the Lok Sabha polls to be held in 2019. If peace and development are the bench marks, nothing stops K. Chandrasekhar Rao from marching back to power for a second term. Till the votes are counted, every party has its undying hopes!